Diabetes mellitus is one of the most prevalent chronic diseases in the USA. If uncontrolled, diabetes can lead to devastating complications. Diabetes medications and medical devices largely contribute to the significant financial expense that the disease inflicts on affected individuals and society. Alongside significant economic burden, there are numerous cutaneous adverse effects associated with diabetes medications and medical devices. Despite the large and increasing number of individuals living with diabetes and the wide use of the related medications and medical devices, there is limited literature that comprehensively documents their cutaneous adverse effects. These cutaneous adverse effects are significant as they can worsen glycemic control, increase disease distress, and may increase risk of associated complications. Thus, it is important that providers can recognize these cutaneous adverse effects, identify the culprit agents, and can properly manage them. 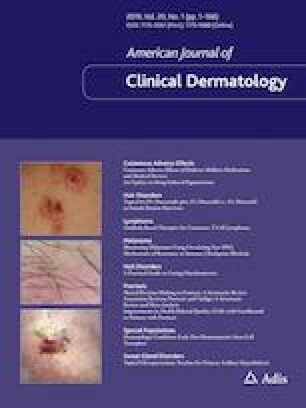 In this article, we provide a critical review of the cutaneous adverse effects of medications and devices used in the management of diabetes and provide insight into risk factors and prevention and an overview of therapeutic management. An emphasis is placed on clinical recognition and treatment for use of the medical providers who, regardless of practice setting, will treat patients with diabetes. The online version of this article ( https://doi.org/10.1007/s40257-018-0400-7) contains supplementary material, which is available to authorized users. Dr. Fazel, Dr. Te, Dr. Segal, and Patrick Jedlowski have no conflicts of interest or financial disclosures to report.